"When it began, I didn't want to believe it was true," said Wang Kun, a senior at Jiangxi Medical College. Wang's classmate, Xue Ronghua, stabbed seven passers-by near their campus on the morning of May 16. "I couldn't believe that things always seen in newspapers could happen to my classmate. It was like I was dreaming." 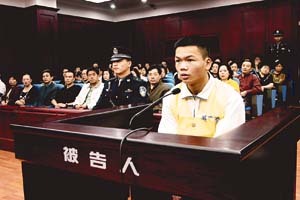 Xue Ronghua, whose violent outburst with a fruit knife left two dead and five seriously injured, gave himself up to the Public Security Bureau of Nanchang, capital of Jiangxi Province around noon the same day, a month before he was scheduled to graduate. What drove Xue to do such a thing? There is no authoritative answer as of yet, but evidence of pent up emotion and psychological ailments can be concluded based on Xue’s previous behavior. Sun Qiang, another one of Xue’s classmates recalled that Xue had acted “weird,” sometimes imagining that passers-by were cursing him. However, his classmates, apparently too busy with their own personal affairs, failed to be alarmed by his behavior though some now admit they sensed something “unusual” about him. The night before the murders, Xue had talked and laughed with roommates while playing cards. It was only after the killing that they came to realize Xue’s peculiarity. Li Yunlong, an expert on capital punishment and professor of law with the Jiangxi Academy of Social Sciences, categorizes Xue as a “destructive murderer” because he slaughtered innocent people allegedly for the sake of killing. Characteristic of such people, according to Li, is to relieve pressure they feel by killing. To them, only through such extreme actions can they demonstrate their self-worth and resist what they perceive as societal indifference, Li says. Incidents of murder and suicide among Chinese college students are not uncommon. On July 15, 2003, a female sophomore at Beijing University’s Medical College jumped with “endless inner pain and distress” from the ninth floor of her dorm, dying instantly. In the six months preceding her tragedy, there had been 14 reported cases of suicide among college students in Beijing, Wuhan and Shenzhen. In late February, Ma Jiajue, a senior at Yunnan University, killed four classmates with a hammer and hid the bodies in their cabinets. Ma had been on the run for almost a month before he was arrested in Sanya, south China’s island province of Hainan. When the police inquired about his motivation for the killing, he replied that it was because they had wrongly accused him of cheating in a card game. The ensuing shame he felt apparently compelled him to take revenge. Guo Li, professor of psychology at Zhongshan University in Guangdong Province, concludes that Ma Jiajue obviously suffers from psychological problems, referred to as a “personality disorder” in psychiatric terms. People suffering this kind of mental dysfunction usually have a distorted perception of reality and lack a sense of security. Even a minor incident, like looking bad in friendly competition, can precipitate aggressive and destructive behavior. Nevertheless, Ma was charged in a court of law with murder, as the killings were premeditated. Statistics from the National Center for Mental Health of the China Center for Disease Control and Prevention show that, according to conservative estimations, 16 to 25 percent of college students on the Chinese mainland currently have mental problems such as anxiety, phobia, neurasthenia, paranoia and hypochondria. Yet few of them seek the professional help of psychiatric counselors after they have thought they may have a mental problem. A questionnaire survey of 100 students, half male and half female, at Guangxi University conducted in early May shows that when students suspect they may have a mental condition, a mere 2 percent choose to talk with someone or seek psychiatric consultation; 12 percent choose to take care of it themselves; 18 percent (of which two thirds were male respondents) said they choose to physically vent their rage. Another survey on mental health conducted by Jiangxi Medical College concluded that more than 10 percent of the students surveyed suffered from at least minor psychological disorders. Students from poor families were generally less healthy mentally, according to the survey. A leading factor that leads to cases of psychological problems with college students is pressure from fierce academic competition and, accordingly, high expectations from prospective employers, according to Zhang Minqiang, Director of the Advanced Education Institute in Guangzhou-based South China Normal University. Professor Guo Li classifies such mental problems among college students into three categories. First, students who do not perform satisfactorily in school usually feel a sense of failure. Several students that killed themselves in universities in Wuhan mentioned in suicide notes that they had “lost confidence in life,” which characterizes Xue Ronghua and Ma Jiajue. 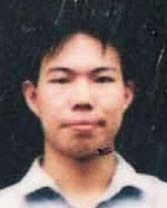 Xue, for example, was cited as saying he was depressed because he failed to pass the fourth level of the national College English Test (CET-4) for which he had prepared quite a long time. Ma, who had been a top student in middle school, delivered average performances in college, which could have been a great blow to his confidence. Second, some students fail to get along well with classmates. Introverted, they do not cooperate or communicate well. Poor students, especially, usually cannot afford urban customs such as treating friends to dinner to establish good relationships, which makes them seem unsociable. Third, many sincerely smitten young students commit suicide because of disappointment in relationships. An “information explosion,” ushered in by the Internet, also contributes. A professor from the Psychology Department of Peking University believes that when faced with the vast information available on the World Wide Web, some students feel that they lack knowledge. Those who cannot determine when enough is enough get trapped in cyberspace; some plunge into insomnia. The majority of college students who suffer from mental disorder are from poor villages. 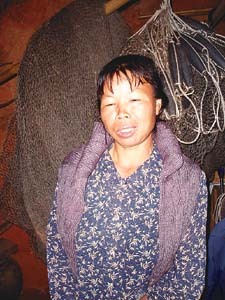 Xue Ronghua, for example, is from a family with annual income less than 2,000 yuan ($241.55). Xue’s father has been laid off from a forestry job and the most valuable thing the family possesses is a 14-inch black and white TV set. Xue and his brother both passed the college entrance exam in 2000 and 2001, respectively. Although the university has offered them allowances, the family has borrowed 17,000 yuan ($2,053) for their education. Ma Jiajue has a similar impoverished background. During college, he often only ate steamed breads. Since his sophomore year, Ma needed to spend summer and winter vocations working part-time to earn money for his education, which is not very common among Chinese youth. Psychologists say that financial inadequacy distracts students from study. An inferiority complex is developed in juxtaposition to wealthier classmates. Ma, for example, often brooded on classmates’ discussion of his “weirdness” (he kept to himself quite a bit), while Xue was annoyed as classmates mocked his “femininity,” probably because he was thin from a spartan diet. Adolescent teasing may indeed be imagined to a degree or exaggerated in the mind. Nevertheless, a person with extremely low confidence is prone to break under what, to most people, would be bearable annoyances, and can distinguish between immature jest and serious threats (if only subconsciously). With more and more students attending college in China, the number of poor students going to school past high school is increasing as well. Statistics show that nearly 30 percent of all college students are poor and 10 to 15 percent are considered “very poor.” Most are from remote villages and the nation’s less-developed interior. In recent years, government and education authorities have offered financial help to poor students. But social and psychological assistance has been overlooked. Mental problems have drawn attention from the government and society as the number of violence incidents and suicide cases on campuses have grown alarmingly. The government has designated May 25 as a day dedicated to the mental health of college students in China, by which they hope to call attention to students’ psychological well-being. A website where psychiatric information and counseling are available opened on the first “Mental Health” day this year. A national support system is being established. Experts emphasize that a warning and intervention mechanism should be set up to supplement psychiatric counseling. Some colleges and universities in Beijing are doing this already. Assessments of students’ mental health are to be kept on file, as schools develop way to compile mental health including surveys, counseling, follow-up investigations and, if necessary, intervention. A “crisis intervention” system is already in effect in Shanghai, providing mental health education to colleges and universities as well as psychiatric counseling to students.